My makeup collection mainly consists of eyeshadows, mostly eyeshadow palettes and a few single shadows. I have a lot of eye products I love to use, so choosing my ‘favourites’ I found difficult but have managed to dwindle them down to a selected few. Like I said in the foundation and powder addition of ‘My Beauty Must Haves’, these are favourites to me from what I have tried, and I will update if and when I try products I feel are just as good or better. Firm favourites of mine are the naked palettes by Urban Decay, I just love how the colours are so practical and have a mixture of matte, satin and shimmer shadows. I own palette 1, 2 and 3; out of these the third one is my favourite and the one I find myself using more than the others. Urban Decays eyeshadows are really blendable, which make them perfect for that classic smokey eye. Another thing I like about these shadows is the fact the shimmer shadows don’t have to much fallout, which is something I normally find with some others. From this palette the shades I like to use the most are dust, limit, nooner and buzz, with limit being my favourite out of the four as it makes a great transition shade. This palette is around £40, which isn’t to bad a price in my opinion because you get 12 eyeshadows in one palette. If you wanted to take a look at the naked 3 palette by Urban Decay you can do here. 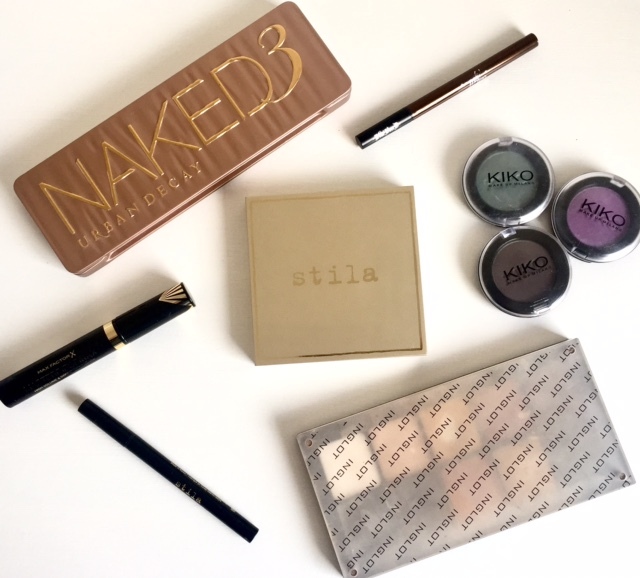 I spoke about the Stila palette in a previous post here, but how could I not include them in ‘My Beauty Must Haves’. Their eyeshadows are beautiful, blend perfectly, and stay all day. I own the mind palette and the soul palette, which are part of the eyes are the window collection. The colours in both palettes are gorgeous and you can easily create at least a dozen different looks, from day to evening. I love the packaging of these palettes, this being one of the things that drew me to buy them. But then I was surprised when the mind palette came in a shiny gold palette, and the soul palette came in a different matte gold looking palette. None the less I love them both equally and will continue using them to create my signature smokey eye looks. You can find the Stila eyes are the window palettes here. Two other brands I’ve included in my favourite eyeshadows are Inglot and Kikko. I’ve owned Inglot eyeshadows for a few years now, and was first introduced to them when I had a palette gifted to me from my mum who had spotted the brand over in America. The main thing I like about Inglot is the packaging, I love the magnetic system they have for their products. It keeps it all together, and makes it easier to store and to travel with. I own three of the square freedom eyeshadow palettes, which I still have some space in so need to get some more of the single pans when I can. Inglot do some beautiful shimmer shades, with the gold toned ones being my favourites. I do find I have to use a primer with their shimmer shadows though, because I get a bit of fallout when I don’t use something the shadows can adhere to. Kikko is quite a new brand to me, and I don’t own that many things from them. But I do own a few of their eyeshadows, which I picked up when I saw they were doing a sale where shadows were only about £2 each. The shadows are soft to the touch and apply beautifully, I find its best to use a primer with these because you then get the best out of the colours. 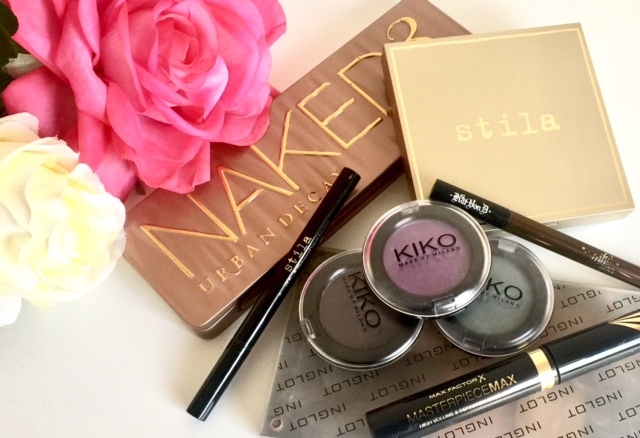 Even though I haven’t been using Kikko for very long, I decided to put them in my beauty must haves because I have enjoyed using them so far and highly recommend them. The Inglot palettes can be found here, and the Kikko eyeshadows are for sale here. Some eyeshadows and palettes I’ve been wanting to try are Too Faced sweet peach palette, Morphe eyeshadow palettes, Makeup Geek eyeshadows, Makeup Forever eyeshadows, and the Viseart palettes. I’m always seeing such positive reviews for these products, so they are on my wish list. Like I previously said in my ‘Did you say Stila sale?‘ post the Stila stay all day black eyeliner is my ultimate favourite and what I wear literally everyday. Its smudge proof, pigmented, glides on, and stays all day…I love it! I’ve also included the Kat Von D eyeliners into my beauty must haves, this is the brand I used before I found Stila eyeliners. I still now and again go back to them because they have some beautiful colours including the golden bronze one, which I like to use when I’m not feeling the black. You can get the Stila eyeliner here, and the Kat Von D one from here. Eyeliners I would like to give a try are the YSL shocking lash eyeliner and the Clinique pretty easy eye lining pen. I used to use gel eyeliners so I also want to try and find a good gel one, which I can then use a brush to apply instead of the pen. I’m a big fan of the MaxFactor mascaras and have been using them for a while now, my favourite being the Masterpiece Max. I love the brush it has as it’s a bit smaller so it helps to pick up each individual lash. This mascara gives volume and length, and I find it works best when I do two coats. This has been my go to for a while now, and I haven’t been tempted to change to any others. But I’m always on the look out for new products to try so if you know of any great mascaras you would recommend let me know. You can find the mascara here. 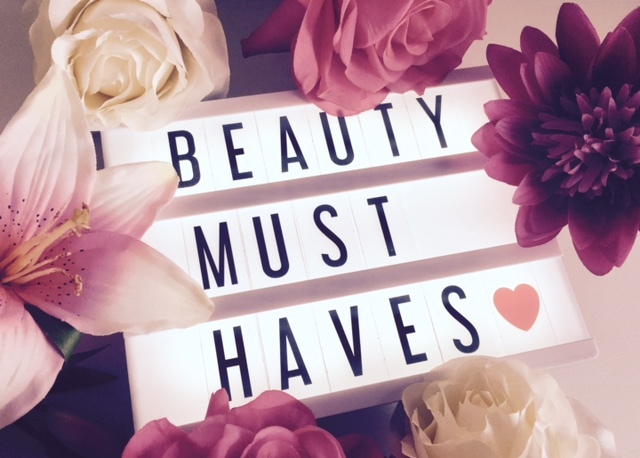 Hope you have enjoyed reading my eyeshadow, eyeliner and mascara favourites from my ‘Beauty Must Haves’ posts. What are your favourites?